Here it is, we’ve made it through to the other side of the storm with nary a scratch. While we did get a boatload of snow, we never lost electricity – to which the kids are saying “awww” because they think it’s an adventure whenever we lose power, and to which the adults are saying “yeah!” because we always have to do a ton of extra work taking care of those very same kids when we lose electricity. 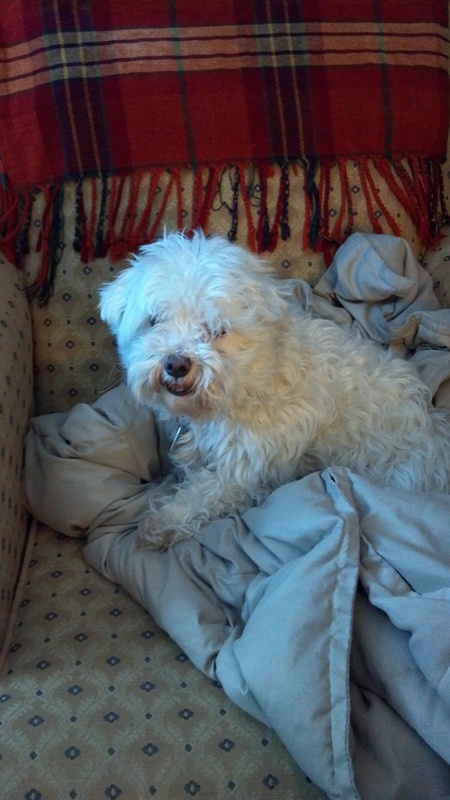 Some of the animals fared quite well, here is our dog; Pippin staying warm in the yellow reading chair in my office. While others in our flock didn’t get it near so easy (or comfortable). 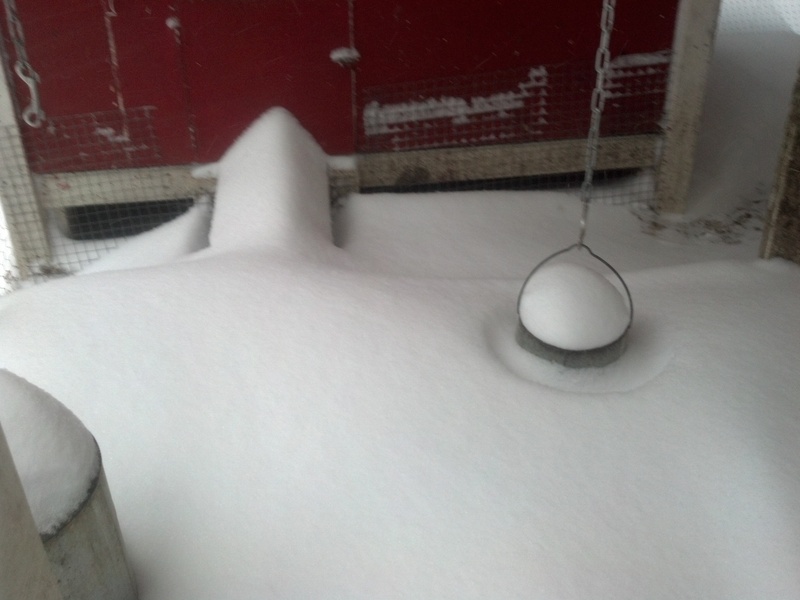 Here is the hen house and coop when Marc went out to check on the chickens this morning. We had been getting a little lazy at night and had not been locking the birds inside before we retired for bed. 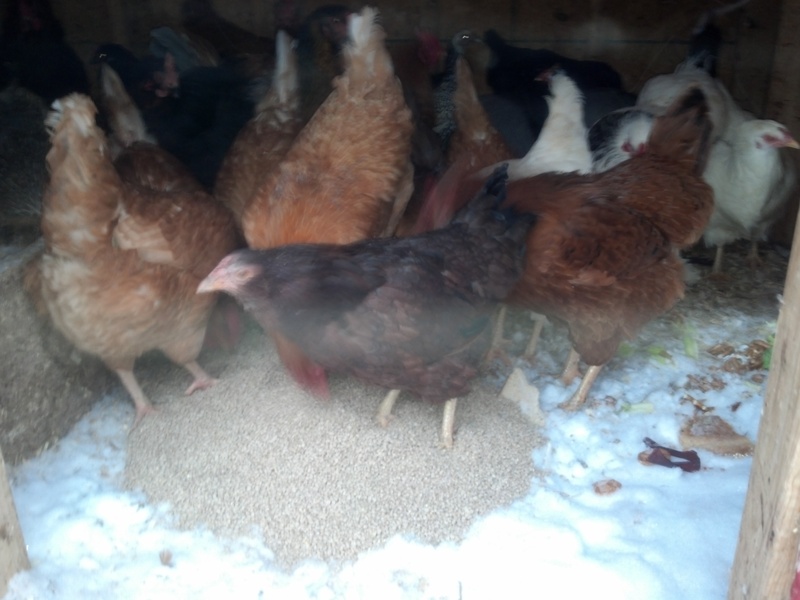 Our coop is fully enclosed and some of the girls seem to enjoy staying outdoors, why not let them, we figured? But I assure you this will end the day a predator figures out how to breach our wire fencing. Thank God we decided to close and lock the door at the top of the ramp last night. As a bit of closeup, this is the chicken feeder that we keep suspended in the yard. That’s a lot of snow for birds with tiny little feet to plow through. 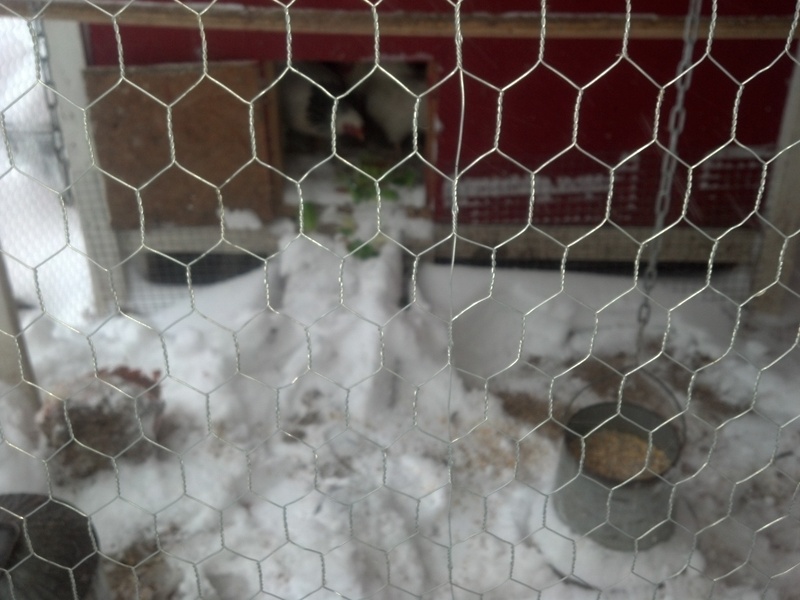 There was no way our chickens (who hate snow to begin with) were going to be going out into that mess. And it also meant, because we have some delicate divas who will *not* touch the white stuff, that for the first time ever – our girls were served breakfast in bed. It’s fine for today, but don’t get used to it ladies. Glad to see your girls are alive and well. Wendy, we don’t ever get snow like that. The last time it snowed here (N.E. Victoria, Australia) and instantly melted was in 2009. Prior to that it snowed in 2000 (or so) and lasted about an hour. I’d liked to know what happened to egg production over the Snowpocalypse? 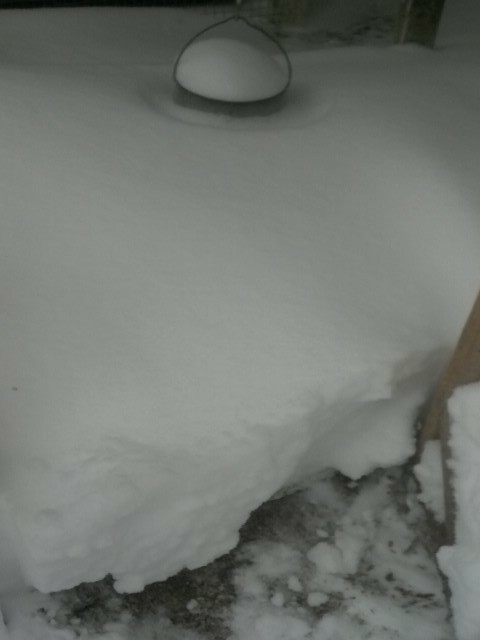 That’s a lot of snow in a hen house. The girls don’t seem to fazed by it at all. No snow out west this morning. A small hawk visited, but did not manage to sneak through the defenses. “Watch the crows! See how they “mob” birds of prey,” I advised the hens. They did not quite get the memo. Each hen pointed her wing tip at a sister and said, “Take her! Not me!” I think they need re-training.